Bonus: Download our free guide The 53 Likert Scales With Copy-And-Paste Answer Choices to help you quickly and easily create your survey questions using the most common Likert Scales including agreement, value, relevance, quality and likelihood scales. The Likert Scale is a rating scale that’s often used when surveying your customers regarding their experiences with your brand – from the service they were provided to the overall effectiveness of your product. It’s one of the most popular question types used by customers of Fieldboom (our survey software) when collecting audience feedback. Unlike binary “yes or no” questions, the Likert scale gives you deeper insight into what your customers are thinking and how they feel. To create a Likert Scale question with Fieldboom, you first want to sign in to your account (or sign up free if you don’t have an account). The Likert Scale is best used to measure and evaluate customer sentiment on a specific product, service or experience. Likert items that center around the same topic should be grouped together in your survey, creating what’s called a “single-topic” Likert scale. The scale itself, regardless of whether it uses numeric or text labels, should be consistent on each item; this prevents confusion for your customers and simplifies the analysis of their answers for you. The most valuable Likert item sets include additional questions that capture open-ended feedback to tell you more about why each customer chose the answer they did. Technically, Likert scales can consist of any number of “points,” or response choices. But, for our purposes, it’s best to provide enough options for your customers to provide an accurate response – but not so many that they become overwhelmed. Obviously, the 7-point Likert scale allows customers to provide more accurate responses (while, again, not providing too many choices). But there’s a more subtle difference between 5-point and 7-point Likert scales. Notice that, in the 5-point example, the most negative response translates to the customer saying there is a 0% chance of them recommending the product. But, that doesn’t necessarily mean they’ll recommend against using the product. In other words, the extreme negative response isn’t a polar opposite of the extreme positive response; it’s simply a null set. On the other hand, the 7-point Likert scale question does deal with polar opposites. Rather than the extreme negative response translating to “nil,” as in the 5-point scale question, the central response represents “no satisfaction.” The extreme negative response, then, represents the opposite of the extreme positive: not only is a person who responds this way not satisfied by the service, but they’re entirely dissatisfied with it. Likert scale questions can provide either an odd or even number of response options. Neither way is necessarily “better” than the other: it simply has to do with your preferences and purposes. An odd number of choices, as illustrated above, allows respondents to report neutrality. On the one hand, there’s a chance that some customers might simply use the “neutral” choice as a way to skip the question altogether – meaning they don’t provide any valuable information regarding the question at hand. On the other hand, neutral responses can prove to be valuable, in that they translate to the fact that your service didn’t do enough to lead your customer to have an opinion on the topic at hand. By providing an even number of choices, you don’t allow for neutrality. Respondents must choose a positive or negative answer. While this might lead customers who were “on the fence” to think a little deeper about a certain question, some might simply skip the question altogether. There’s also the very real possibility that a customer truly doesn’t have an opinion regarding a certain question. If these individuals are forced to choose a side, their response could skew the overall results of the survey. In either case, there’s a possibility of your customers responding ambiguously. In these cases, your best bet may be to provide room for your customers to expand on their answers in order to avoid discrepancies and unusable data. Let’s take a look at each in a bit greater detail. An agreement scale is the most common use case for a Likert Scale. Using this format, your customers would be provided with a series of statements, for which they select Strongly Agree, Agree, Neither Agree Nor Disagree (or Neutral), Disagree or Strongly Disagree. 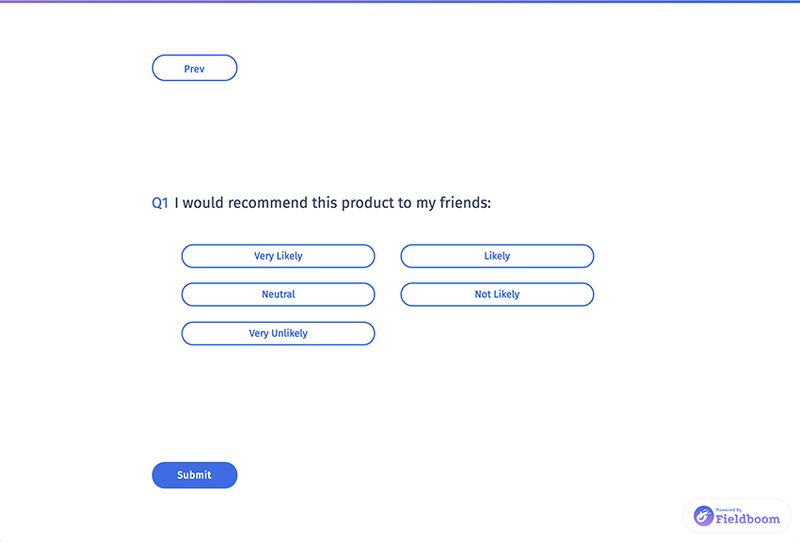 The likelihood version of a Likert scale is most often used to determine the probability that your customers will adopt a particular behavior, whether that behavior is buying a product or recommending a service to others. This common Likert scale measures how satisfied each customer is with a particular experience, product or service. As with the example above, the satisfaction-based question is most often used to get an opinion from customers about your service or support. The importance scale provides deeper insight into reasons behind more general opinions. It shows how strongly your customers rank the influence of various factors for an experience, product or service. Though analysis of Likert scale data can be quite the scientific and mathematical undertaking (especially in determining validity, distortions, etc. ), in this section we’ll discuss a simple way in which to interpret the data you’ve collected, which is determining the percentage of your customers that respond a certain way to each individual question. Most commonly, Likert scales are evaluated by giving each option a value and then adding these values together to create a score for every customer. Though relatively simple, this reporting method makes it easy to evaluate the opinions revealed by each Likert option. A chart of scores can offer visual insight into sentiment on a particular Likert scale. By doing this for each question, you’ll be able to determine areas in need of improvement, as well as areas in which your company is thriving. You also might notice areas of concern where you initially might have thought things were running smoothly. In the example above, though most respondents reported at least an above-average level of satisfaction, there are still those who reported a below average or poor experience. In this case, it’d be worth digging into how these customers responded to other survey questions to get a better idea of what went wrong in their experience. The most important factors in reporting on the Likert scale are consistency in values and cohesiveness in questions or items that are evaluated together. Questions that are out of place can skew the results, making it harder to take the right actions based on the answers your customers give you. Going along with the last notion, the answers your customers provide when completing satisfaction surveys might not always be entirely accurate. Simply put: human nature sometimes gets in the way of customers responding openly and honestly. The most efficient way to combat these distortions is to always give your respondents the option of providing more detail – or discussing confusion – regarding a specific question or set of questions. As the name implies, central tendency bias refers to the notion that some respondents may avoid choosing the most extreme options provided. The most common explanation for this tendency is that respondents don’t have a clear definition of the extreme high or extreme low with regard to a specific question. For example, when responding to the question “How would you rate our company’s customer service?” (with responses ranging from “Unhelpful” to “Extremely helpful”), a customer who did receive exemplary customer service might get caught up in the semantics of what “extreme” actually means. It’s possible that, although they acknowledge the service was exquisite, they are hesitant to report that it was the be-all-end-all of customer service. Another explanation for central tendency bias is that customers might initially “save up” their “extreme” answers for later questions. If they answer the first question with an “extreme” answer, they might view the rest of their answers through the lens of this first answer. (i.e., to respond with an “extreme” answer to subsequent questions, their level of satisfaction will have to match the level of satisfaction regarding that first question). In addition to providing opportunities for respondents to expand on their answers, you can also avoid falling victim to central tendency bias by either providing context for what certain terms (such as “excellent”) mean, or allowing respondents to define the terms in their own words. In contrast to central tendency bias, extreme response bias is the tendency for some respondents to only answer in extremes. Of these four reasons, the only one you truly have control over is the last one. Ensure the questions you ask don’t lead respondents toward a certain answer, and also that each option is clearly defined and understandable. You can address the issues of cultural and intellectual diversity by soliciting demographic and other personal information from each respondent. While not an absolute determinant by any stretch, it’s possibly the closest you can get to figuring out why a respondent answered as they did (short of asking them, of course). Regarding the amount of effort they put into completing the survey, you might ask them to report the amount of time it took them to complete it. This could help you determine if they put serious thought into their answers, or if they simply used a “black or white” approach, ignoring all “in-between” answers. Acquiescence bias refers to a respondent’s tendency to go along with a statement in an effort to avoid ruffling feathers or insulting anyone. For example, say a customer received subpar service from an employee who truly did their best to meet the customer’s needs. Though the customer didn’t end up with the result they desired, they might report they received “excellent” customer service from said employee simply because they tried to be helpful. But, for the purposes of the survey, such a response isn’t helpful at all. To avoid such a discrepancy, ask clear and specific questions throughout your survey. Using the above example, if the customer was asked about the employee’s willingness to help (in addition to being asked about the service they received), they would have a chance to show that the employee tried to help, but ultimately wasn’t able to. Another way to possibly avoid acquiescence bias is to make clear to respondents that the purpose of the survey in the first place is to improve customer service across the board. Though there will certainly still be cases of such bias, this simple disclaimer might open the door for more honesty from many of your customers. Likert scale questionnaires can help you gain valuable insight regarding your customers’ experience and levels of satisfaction with different aspects of your company. In turn, you’ll be able to improve areas in which you fall short of your customers’ expectations – and strengthen the areas in which you’re already doing quite well.